It was a balmy spring morning in a Southern California coastal community and tiny streams of leftover rainwater make their way around weed bumps in a suburban school garden. The fog is lifting and the place is peaceful although a bit disheveled. One lady takes a seat on a crude bench made from cement blocks and wood boards. Soon classes will walk by on their way to recess and notice something new, and students will point feverishly at large heaps of seaweed, a solar oven or something even more mysterious displayed on the massive redwood planting table. Later on, energetic fourth and fifth graders in the garden club will spend the rest of their lunch hour filling water buckets, planting seed and hanging out sipping herbal lemonade from tiny paper cups. A few months ago on the East Coast, a large group of parents met to kick-off a new school garden. It took months to plan. It was a struggle to finally get the go-ahead. A committee discussed topics and argued approaches for weeks until it felt a little like the PTA. So much red tape. The garden is managed by parent volunteers. They rotate on a schedule. There was a ribbon cutting ceremony and an official launch party. Teachers were given responsibilities too. The garden seems to be a well-oiled machine. Parents show up ready (and many times not ready) to direct the kids, work the soil, and fill seed cups for the children. There are plans to make the space even bigger because it seems there’s not enough space to grow a carrot for every child to take home. When a group of “littles” approaches the entrance to the garden they are always greeted by a few mommies and daddies wearing smiles of supervision. It’s a good thing they are there just in case a splinter slides its evil head into an innocent finger. Back in the “Wild West” there are no parents in the planting area other than the garden coordinator and a teacher watching as the kids climb on the pile of organic compost and fill their grow bags with half-spilled spades of soil. One boy in light blue jeans looks at his right knee at a fresh streak of dark dirt. It causes some fear in his eyes and almost breaks his playful concentration. The plot seems huge despite it being flanked on three sides by tar and buildings. One of the girls throws a pebble and she gets stared down by her classmates then goes back to her bag. June approaches, the end of the school year. 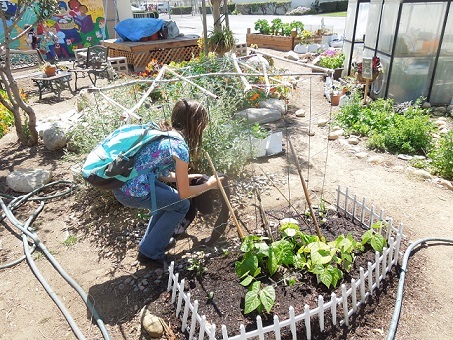 Parents in the Eastern school garden feel a great sense of accomplishment. They did a wonderful job supervising their children and setting things up for them to succeed – didn’t they? (That’s a rhetorical question.) When they talk about it to friends, it’s always, “We” did this and “We” did that. In reality, many parents are relieved that they’ll have a break over the summer because they often didn’t want to volunteer on a particular day or they had to rearrange schedules at work, or had to find a babysitter for their youngest while they did their duty at school. The Western garden has a new layer of mulch on the beds and the greenhouse is cleaned out. The students remember how much fun they had searching for red wiggler worm eggs, pushing burlap bags over to harvest potatoes, digging holes, arranging stepping stones,rearranging stepping stones, tying down the greenhouse in a wind storm, foraging for nasturtium seed, watching a tomato hornworm pupate, picking Malabar spinach leaves off the vine and standing under the mist of the hose acting like delinquents, just for a few seconds. It was their own special paradise free from parental supervision and forceful suggestions. The herb garden is still half planted. Weeds seems to be popping up everywhere. The strawberry patch is now dedicated to Mr. Ted, the friendly maintenance man always smiling at the children and telling stories of his wife’s garden at home in the Philippines. The principal stops by with a boy who has had a rough day. (Yes, people do have rough days in Southern California.) The garden is quiet now. She sits with him near the zen pit and doesn’t say a word while he draws squiggles in the sand. All during the school year, at the dinner table or while in the car, students told their parents about the various garden projects and experiments they enjoyed – including the many garden bloopers along the way! It was fun having the parents visit the garden during open house. They were welcome anytime to stop by and see what was growing or learn a new tip. Students often gave tours, highlighting their favorite plants, projects and memories. The kids know how worms recycle food scraps into soil amendment, why organic compost is better than bagged soil containing chemicals, and what kohlrabi is. And somehow Brussels sprouts taste better when there are no parents around!